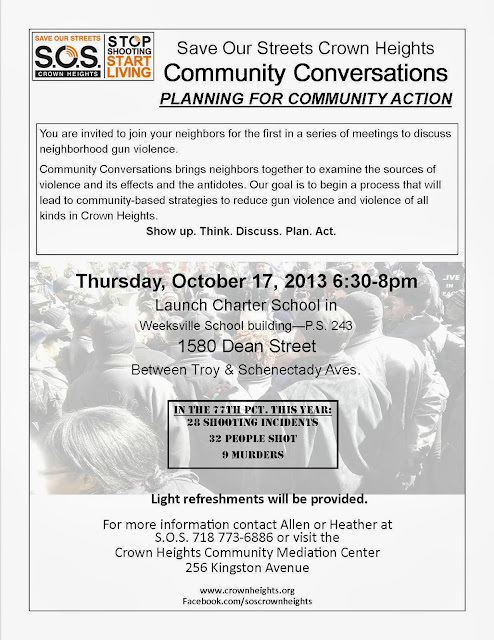 We are excited to announce that we will hold the first in a new series of Community Conversations, meetings to discuss neighborhood gun violence, on October 17th. Our goal is to begin a process that will lead to community-based strategies to reduce gun violence and violence of all kinds in Crown Heights. Please join us to share your thoughts, and discuss community action with your neighbors. The event will be from 6:30-8 pm at the Launch Charter School. Clients who fill out a goal sheet are given an S.O.S. backpack, notebook, and pair of sunglasses. “So many members of the community want to help young people stay focused on their goals. 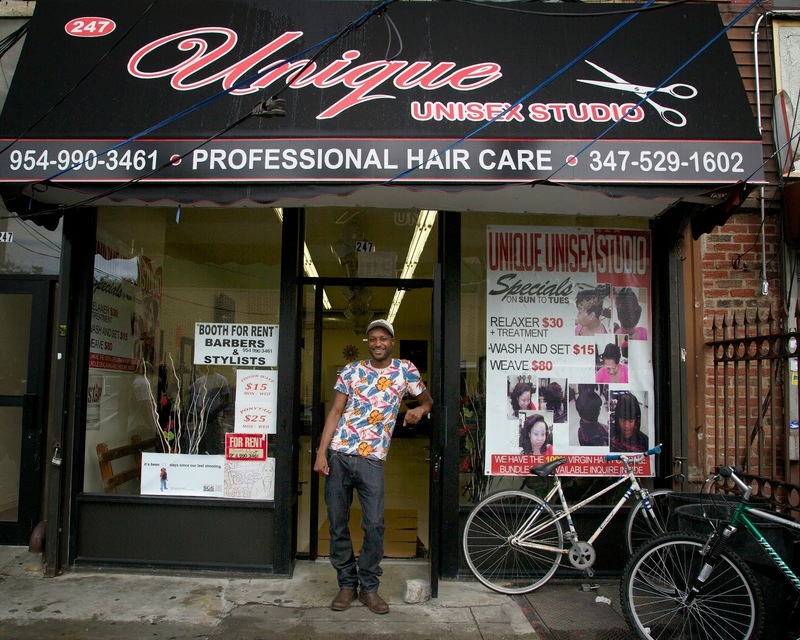 It’s our hope that having the barbers and beauticians work with their younger clients on their goals sheets and then check with them on how they are doing during their next appointments, they can be an additional encouraging adult in the student’s life, “ said Program Director Amy Ellenbogen . “Sometimes people want to ‘be a part of the village that is raising the child’ but they aren’t quite sure how to do it, and they also want to mind their own business. These goal sheets will provide barbers and beauticians the tools they need to become a positive presence in the lives of young people and the excuse to be involved." This past Saturday, September 14th, S.O.S. C.A.N. hosted a Strategy Breakfast in the fellowship hall of Bethany United Methodist Church. It was attended by 44 faith based leaders, including newly appointed NYC Councilwoman Laurie Cumbo. At this breakfast, Rev. Jones, the Clergy Liaison for S.O.S., strategized with the faith leaders about how to assist and embrace today's young people. The session began with Brandon Gibson, coordinator of “Make It Happen,” a program geared towards helping young men of color between the ages of 16 and 24 overcome experiences with violence, and succeed in spite of those experiences. Rev. Jones and Joy Brown shared their vision for an upcoming youth summit entitled “Power Filled Me: An Opportunity to Hear our Youth”, scheduled for October 23rd at Union United Methodist Church, (121 New York Ave) from 6-8:30pm. 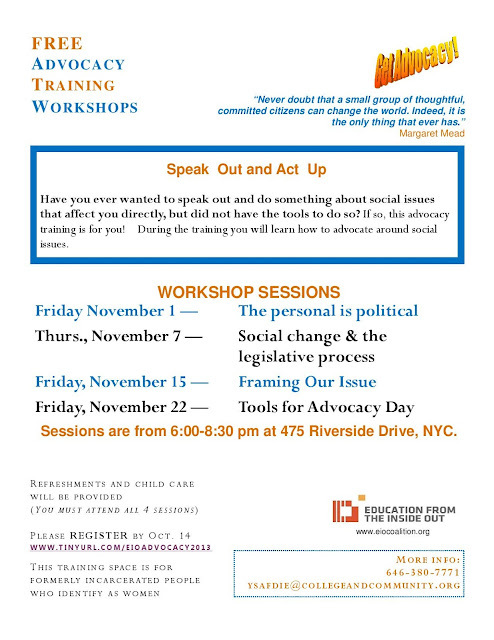 “Power Filled Me” will be an opportunity for young people to sit on a panel and speak to adults in their neighborhood about their thoughts and what motivates them, along with what it is they need from parents and the community. Also discussed were “Peace Month” initiatives, including the 2nd annual “Faith Walk with Prayers” on October 27th, where faith leaders will be gathering on the corner of Nostrand Ave and St. John's Place, walking, singing, and praying on every corner, ending at Troy Ave and continuing inside Beulah Church of the Nazarene for fellowship and refreshments. Rev. Jones asked congregations to host nonviolence services the first two weekends of October. The session ended with networking between leaders and volunteers. According to Rev. Jones, "This was our best breakfast yet. It was emotional, powerful, gut-wrenching, and so passionate." 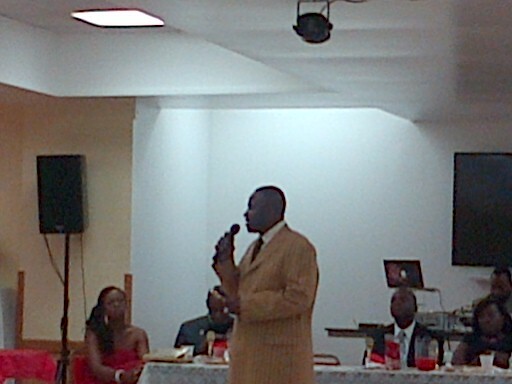 On Sunday, September 8th, the Women's Motivational Services of Brooklyn honored Pastor Kevin Jones, C.A.N. Clergy Liaison for S.O.S., with its Man of the Year Award for his community work against violence of all kinds and for his work with people at risk. Pastor Jones was unable to attend to accept the award and S.O.S. Senior Outreach Worker, Derick Scott accepted the award on Pastor Jones' behalf. In his acceptance remarks, Derick highlighted Pastor Jones; role in organizing pastors of churches across Crown Heights to work beyond their own congregations to engage with the most at risk and the most needy people of the community, particularly young men and women. Derick also explained the work done by Pastor Jones to help create safe havens for women and young people who have experienced violence and remain at risk. The event was organized and Kathy Elliot, President of the organization and a prominent organizer for Beulah Church of the Nazarene.